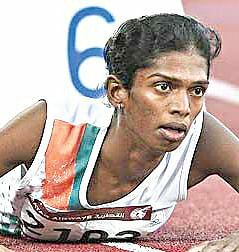 CHENNAI: In December 2006, Santhi Soundarajan failed a gender verification test shortly after winning silver in women’s 800m at the 2006 Asian Games in Doha. She was not only stripped off her medal, but also left in the lurch by the society. In 2011, gender verification tests were done away with and tests were done only to determine the androgen level in female athletes. On Wednesday, a similar case came to the fore when 18-year-old Odisha sprinter Dutee Chand was deemed unfit to compete in the female category as reports showed that her androgen levels were higher than normal standards. Santhi extended her support to Dutee and said the youngster should not be victimised. “I got to know about this issue when I read the papers this morning. Did the government know about her androgen level problem and not take any action or were they ignorant? Till she gets treatment, she cannot take part in female category. This is when we must all support her. She is a bright athlete and a medal hope for the country. India should not miss out on her. The government should take it upon them to get her treated and make sure that she runs again. If they don’t support her now, her life would be ruined,” she told TNIE on Thursday. It’s been almost eight years since her incident, but Santhi is still recovering. A couple of days ago, she joined the SAI facility in Mayiladuthurai as a coach. But her wounds have still not healed. “It’s equal to killing someone. I know how difficult it is to recover. They took me closer to death. I couldn’t live in peace. It took many years to overcome the trauma. I am still struggling to come to terms with it and have not fully recovered. My dreams were shattered and it felt like my life had come to a standstill. This issue has come to the fore again and Dutee shouldn’t suffer as I did,” she added.